including Asia which widely spreads in front of the doorstep of Osaka. Being a leading terminus in Western Japan, many people come and go in the area facing Osaka station. "It is here, on a vast remaining land of roughly 24 ha where public, private and academic stakeholders havejoined-hands to promote the "Umekita" redevelopment project, which is significant to the growth of the entire Kansai area." From very long ago, Osaka has been known for being proactive in absorbing and passing on new and surpassing ideas. Having inherited this DNA, Osaka is responsive to changing times and dreams, while aiming to be a `town` of flexibly continuing growth. It is a "Knowledge-Creation Space". Through the "Circulation of Knowledge" from people and information gathering from around the world, new businesses and lifestyles will be created. 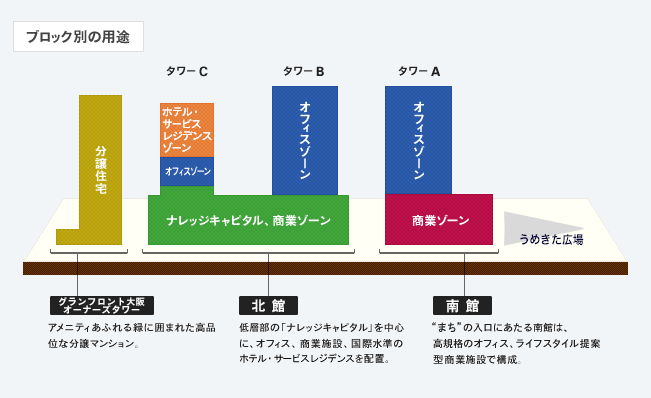 NTT Urban Development Corporation and 12 other companies are responsible for developing an advanced development zone of approximately 7 ha.It is called the "Grand Front Osaka (Umekita Advanced Development Zone Project)". The goal is to create a "town" that possesses the variety of functions of a metropolis, the power to synergistic attract, effect and continually evolve. "Knowledge Office Space", consisting of knowledge work space (for researchers, creators, business owner) and educational functions and "Future Life Showroom" exhibiting new lifestyle delivered by the fusion of advanced technologies and sensibilities are represented. Click here for "Knowledge Capital" details. A general incorporated association "Grand Front Osaka TMO" was established to operate the Grand Front Osaka integrated town. A participatory type of "town" development is promoted to grow the "town" along with its residents, workers and visitors, to bring bustle and vitality back to a place people will want to come to every day. New value and concepts are created by bringing together people and information, and mutually encouraging stimulus of the group. More people and information will be accumulated by spreading the gathered information. By repeating this cycle, the town will grow larger and more prosperous. Much effort and care has gone into creating a space for people's comfort & relaxation. 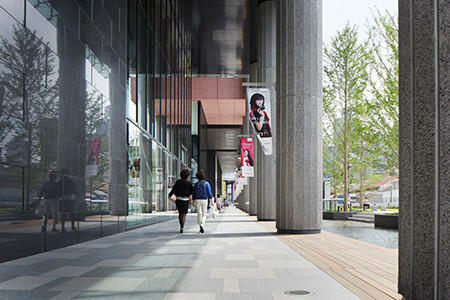 With the waterfront area delivering the impression of Osaka as an aquapolise, rows of trees beautifully reflected in water have been planted creating a road network of "Umekita Plaza" ,"Ginko" and "Brooklet" roads. 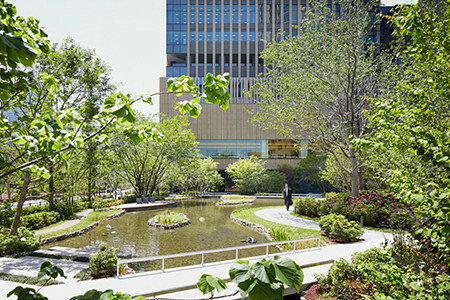 The vacant land adjacent to the North Wing/Grand Front Osaka Owners' Tower offers a spacious ambience of green. It provides a peaceful place for sanctuary valuable in the heart of the city. The "town" has a pleasant round-trip pathway. This "Path of Creation" runs north to south through 1st and 2nd floor building level. 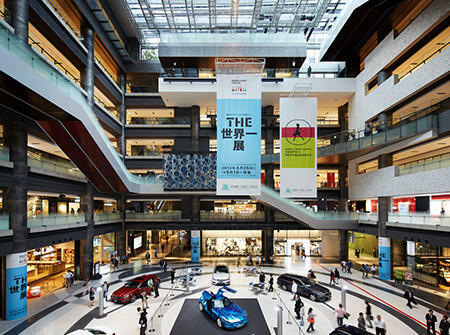 On the first floor of the west side of the building is a space filled with pillars known as "City Gallery". JR Osaka Station and Hankyu Umeda station are connected by a walker-dedicated deck. This provides a safer and smoother pedestrian network that enables access to the surrounding areas. 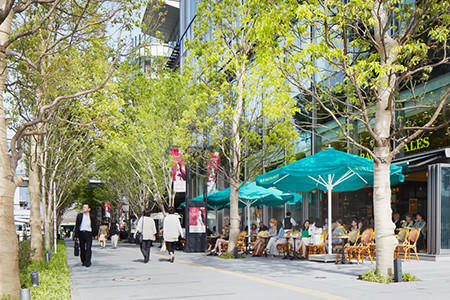 At the axis that links the east and west areas, commercial facilities like cafes and the rich line of Japanese zelkovas give an accent to the sidewalk. This sophisticated sidewalk space brings bustle and vibrancy to the area. The "Knowledge Plaza" located at the center of the North Wing is a symbol of the "town". Events and presentations linked to the Knowledge Capital are held here, bringing even more life and vitality to exchanges between people in the city. 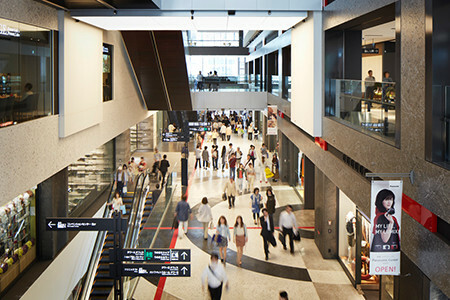 Right on the doorstep of JR Osaka Station's North Exit is a space approximately 10,000 m2. Here, people are free to gather, relax and enjoy an uncluttered, wide-open plaza. In this place, which allows integrated use of space both above and below ground level, events are planned to deliver variety of information. 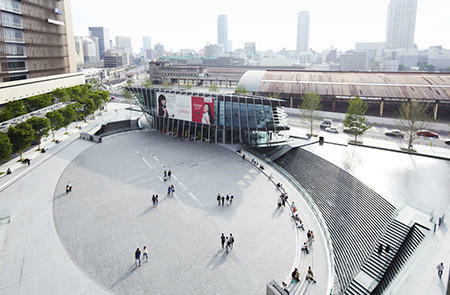 We will nurture this plaza to become a new symbolic space in Osaka, a place to be familiar and loved. NTT Urban Development Corporation, Obayashi Corporation, ORIX Real Estate Corporation, Kanden Real Estate Corporation, Nippon Steel Kowa Real Estate Co., Ltd., Sekisui House Ltd., Takenaka Corporation, Tokyo Tatemono Co.,Ltd., Nippon Tochi-Tatemono Co., Ltd., Hankyu Corporation, Sumitomo Mitsui Trust Bank, Limited, Mitsubishi Estate Co., Ltd.
Of the 12 companies selected to participate in development, NTT Urban Development Corporation is mainly responsible for offices in the middle floors, and Tower C where a hotel is located on the upper floors. 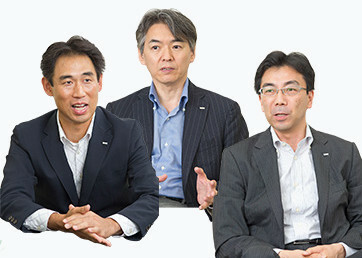 We have interviewed our lead people of this development project on the progression of Kansai`s first "Intercontinental Hotel", from invitation to completion, and the vision for future development. 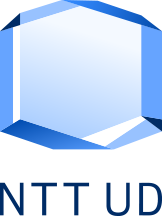 -- Give us an overview of the project. 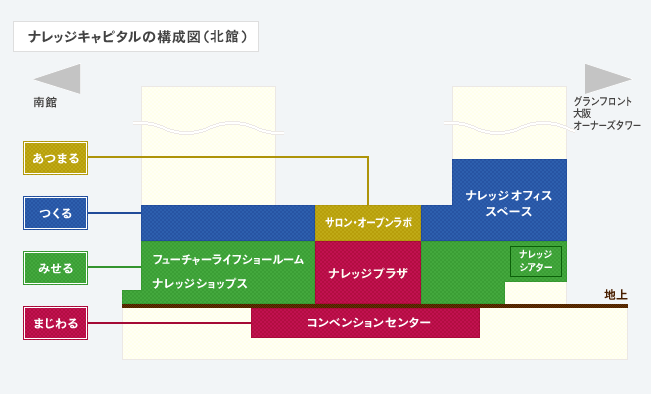 The "Grand Front Osaka (Umekita Pilot Development Land Project)" is planned to cover approx. 7 ha of developments and to be jointly operated by 12 companies, which makes it one of a few big projects in Japan.Moreover, this is the first time NTT Urban Development has played a consistent role from invitation of a 5 star multinational hotel, designing facilities right through to operational planning. -- What was the intention of the hotel invitation. We put our feelings in the name 'Grand Front Osaka' "to continue to be a leading town open to the world,"appropriate for the new gateway of Osaka.From the project-planning stage, our 12 companies involved in the development believed that we should invite an international class hotel to impart a type of gate-way functionality that links Osaka to the world and to enhance its overall hospitality. -- What are the special features of the completed hotel. The hotel has a role of enhancing service functions of the "town" in terms of hospitality and amenity as well as to draw visitors from all over Japan and the world.The hotel will have restaurants, banquet halls, 215 guest rooms that will be an average of 50 m2 or larger. We will also prepare 57 residences complete with kitchens and laundry systems so that guests from overseas, or our long-term residents will feel right at home. We believe the hotel`s amenities will be second to no other luxury hotel in terms of facilities and services. Also, even though it is one town, we placed importance on a design that matches each of its functions and personalities. We took great care in the design to contrast with the office building with a modern, leading-edge feel, yet also give a sense of peace and tranquility. "We took to heart Intercontinental Hotels Group's (IHG) intended ""wish to use authentic materials"". The interiors use natural stone/wood abundantly. The exterior also utilizes natural materials and warm hues. "A garden with abundant with greenery and water is set between the condominium buildings. "The Garden" as it is called is a peaceful, wide-open space where it is easy to forget you are in the city center. "Fusion of ""Japanese"" and ""Global"" elements that emerged on the way to completion"
-- Did you encounter any challenges? There are some differences in commercial practices between Japan and other countries in how hotels are operated. Learning how to adjust for those differences was the first hurdle.Hammering out an agreement was no easy task. However, we continuously discussed issues amongst the 12 developers and after many late-night meetings with partners overseas, we were finally able to reach an agreement.We also needed to make many decisions for the hotel, such as the "brand standard". It took a long time to obtain approval from the hotel partner.There were many difficulties in making decisions within the limited amount of time we had, including work to ensure the facilities/interior were aligned with the construction of the entire town, and progress being made at other buildings. We decided upon many other important aspects of the project by constantly deliberating and discussing with all 12 developers to reach a consensus. Conversely, I feel that we learned a great deal by being exposed to the detailed vision offered by the company of five-star hotels and resorts located in over 60 countries. We learned theirf attention to detail that goes into facilities and specifications that are convenient for guests, and how to create an extraordinary space. -- Is there any particular points that you consider to have led to the completion of this project? We conducted meetings periodically to fill in the gaps between overseas and Japanese culture and approaches. We worked hard to smoothly move things forward while clearly and mutually understanding opinions and conditions.More than our different viewpoints, we shared a desire to create something wonderful, so I think we were able to deepen our mutual trust over frank and open discussions. This is because, from our stance of contributing capital as developers, we sometimes proposed specifications and material changes to hold down costs to an appropriate level, but I think things progressed quite smoothly.For example, even in selecting materials, we thoroughly studied choices from a variety of aspects and clearly offered our findings. Or in other cases, we took preemptive actions for areas that experience told us could cause problems. I think our partners got a real sense of the scrupulous Japanese work-ethic and the Japanese approach to "monozukuri"; craftsmanship.In other countires, it is apparently not unusual for construction work to be delayed. The IHG stakeholders were impressed that our project progressed according to schedule and there was not one piece of garbage left lying around the construction site. This surprised us. -- Can you describe the situation after construction was completed? Approximately five months after we opened the town, we had a total of 27 million people visiting the entire Grand Front Osaka. Sales at commercial facilities exceeded ¥20 billionWe are still seeing an increase in the number of hotel guests and the hotel's reputation.We have achieved results beyond what we originally expected.Every week, at the Ume Kita Space that is directly linked to Osaka Station, music, sporting, and other cultural events are held. A local group activity called "Socio" is becoming quite popular. 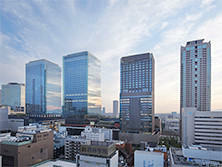 The area around Osaka Station was originally a central area developed as an under-ground city. But, the area is being accepted as a new environment that enables proximity to rich natural surrounds even though you are in the city center, and also functions as an open space where many people can gather and interact. -- Tell me about your future aspirations. In the future, we may need to review our operations, facilities and environment in response to actual customer demands.We believe that we must work together with IHG to grow the hotel into a facility that will always satisfy guests. -- Lastly, do you have a message to pass to guests at "Grand Front Osaka"? IHG uses a catch-phrase: "In the Know". It means to provide customers with experiences and sensations that can only be offered at that particular region.We are still in the search-stage, but we are making a variety of proposals during meetings. Some of our ideas include possibilities such as group activities for learning how to provide proper hotel services, and content linked to the hotel etc. We expect much more collaboration with the town in the future.We aim to lead the hotel market in the Kansai area. We also want to contribute to creating an attractive town centering on this hotel.